This cosy two bedroom apartment is located in the historic city center of Siena (inside the city walls) approximately 300 meters distant from „Piazza del Campo“. 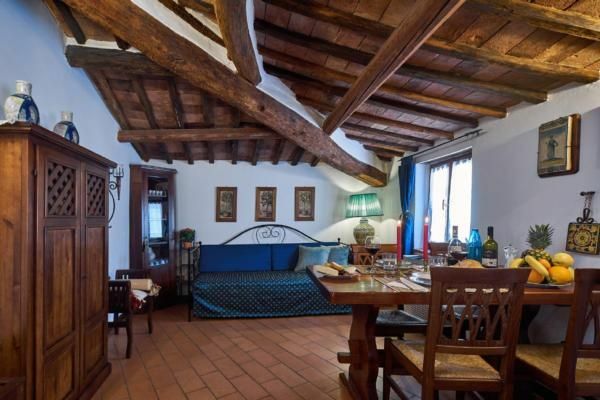 The apartment is on the third floor of a small typical, ancient Senese town house built in the 16 th century. The street of the apartment is one of those classical medieval streets which are typical for Siena and is inhabited only by Senese residents. Staying in this „contrada“ you may feel like being Senese instead of being tourist. All the main attractions of the historic centre are within walking distance, so you do not need a car. In case you come by train or bus you may take a taxi which is just a 5 to 10 minutes drive to get to our place. If you come with your own car you can leave it at the public car park „San Francesco“ which is just a 5 to 7 minutes walk away. Escalators bring you comfortablely close to the parking as well as to the bus stop of local shuttle bus. The bus terminal of „Via La Lizza“ is just a 4 minutes walk. Frequent bus services to multiple places in Tuscany and to many destinations in Italy (Rome airport, Milan, Naples, etc) are offered over there. So you can reach nearly any city in Tuscany or Italy by bus. The apartment has been reasonly renovated maintaining the typical Senese style of the medieval beamed ceilings, geniune „cotto“ floor tiles and doors traditionally made of red chestnut wood. It is furnished with typical tuscan antique furniture to make you experience Siena at it's best. Please check our floor plan for the exact room lay out. The apartment is an ideal base for a family of three to four people that want to experience life in this wonderfully preserved medieval city and may also want to discover its surroundings: Chianti, Val D’Orcia and many Tuscan cities. There is free internet access (WiFi) available in the apartment. Our rate includes: linen and towels and utilities. As the flat is located on the third floor (without elevator) of an ancient Senese town house the stairs are narrow and steep and may not be suitable for senior citizens. - Final cleaning: once per object Costs amounting to 20 EUR (Mandatory).